When we measure to prove our success, we bias the type of information we will value and use. That information might get those monkeys off our backs, but it blinds us to what’s really going on. We’re less informed about how to manage the performance of the organisation under our care. How we currently try to deal with accountability and transparency is a trap. It would be lovely to tell those monkeys on our backs what little Hugo tells his monkeys (It cracks me up every single time I watch it!). We do, however, have a more grown-up way to get out of the accountability and transparency trap. See the trap: Vanity metrics are not performance metrics. Firstly, we need to appreciate that the information we’re currently feeding those monkeys on our backs is sugary sweet and nutritionless. Vanity metrics, as many people call them. Most definitely are not meaningful performance metrics that drive learning and improvement and creating excellent stuff for our stakeholders. And we perpetuate the same vanity-metrics dependency throughout the organisation. I facilitated PuMP with an IT team in an investment company and they insisted on measuring dozens of things. So their draft set of metrics was huge, and told the story of how busy and important the team was. As they progressed through PuMP, they shifted their definition of success, and ended up with just two KPIs that focused entirely on what was most important to their internal customers. So we need another way of thinking about success. Side-step the trap: Stop trying to prove success. Secondly, we need to change our mindset about what we need to prove to those monkeys. 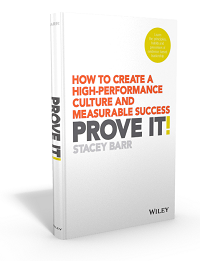 My second book’s title is somewhat provocative: Prove It!, but it’s not about proving our success, or proving if we’re good enough, or proving if we’ve hit our targets. It’s about proving that our decisions are fact-based and deliberately focused on improving the performance of our entire organisation. It’s about proving which improvement initiatives are worth continuing and which are not having the impact we wanted. This is from his article “On Why We Need New Metrics of Success In Our Work”. I’m not sure Josh’s suggestion for new metrics is the full answer. I absolutely know that we can meaningfully measure the intangible things a lot more than most leaders’ measurement skills currently permit them. But the results that Josh Radnor describes with those visceral words ‘hearts opened’ and ‘wounds healed’ are easily trivialised by quantification when we aren’t yet masterful at measuring the intangibles. That’s how we end up with vanity metrics: we don’t have the skill to meaningfully measure what really matters, so we measure what makes us all feel good. But as I said, new metrics isn’t the full answer. Another part of the answer is we need to stop relying on metrics to make us feel ‘success in our work’. 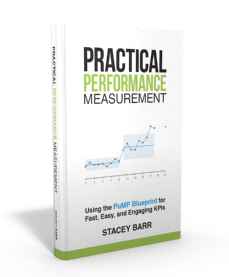 performance metrics to continually improve success. Let’s nourish our sense of achievement by moving the dial, not by where the dial is currently sitting. Unset the trap: Tell the story of improving success. When we want to improve a result very deliberately, to make it better and better over time, meaningful quantification is what we need to baseline, guide and test our success. These performance metrics will live at all levels in an organisation, owned and used by people at all levels. The cause-effect (and other) relationships that link the organisation’s metrics together make it possible for the metrics to collectively tell the story of how we are improving our success. thank you messages, pictures. And with no need to quantify these. Until we get better at quantifying intangible success in a meaningful way – and believe me we can! – let’s replace the vanity metrics with more powerful stories of how we are improving success. Without evidence-based leadership, it’s little wonder leaders feed vanity metrics to the transparency and accountability monkeys on their backs. If your metrics are not informing your decisions, then take a close look at why. What purpose are they serving? Is it a useful purpose? Are those metrics appropriate for that purpose?